You’re now responsible for a programme, or you’ve got a portfolio to manage? Where do you start? Right here! Projects are not simply the bread and butter of an organisation. Form them into programmes or portfolios and they can be prioritised and integrated to deliver change to your organization in line with your strategic vision. You will be able to control costs and risks and bring together a complex series of themes effectively. This overhauled second edition now combines portfolio management as a parallel theme with programme management, and it is brought in line with the current thinking of the Association for Project Management and the Project Management Institute. It is written for managers in both the public and private sectors. This new edition includes half a dozen short case studies (from Belgium’s Fortis Bank, a software company, local government, and central government), along with more on cross-functional management. 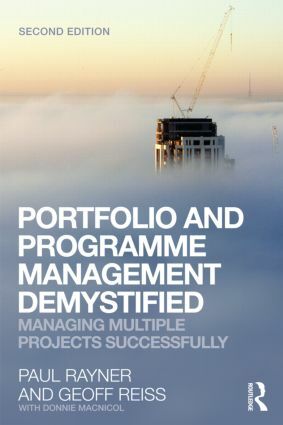 Together with Project Management Demystified, also from Routledge (third edition, 2007), it provides the tools to manage your projects, your programmes and your portfolio to a very high level.